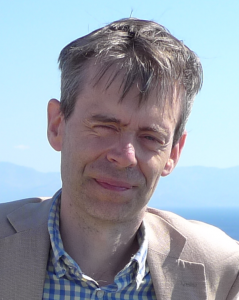 Profile: Dr Greatrex is Professor in the Department of Classics and Religious Studies at the University of Ottawa, Canada, where he has taught since 2001. Having obtained his M.A. and D. Phil. from Oxford University, he has worked, since 1994, at the Open University (England), the University of Wales (Cardiff) and Dalhousie University (Halifax, Nova Scotia). He is a member of several journal editorial boards, such as Millennium and Byzantinische Zeitschrift, as well as having served as president of the British and Canadian Esperanto associations. Profilo: Geoffrey Greatrex estas profesoro en la fako de klasikaj kaj religiaj studoj en la universitato de Otavo, Kanado, kie li instruas ekde 2001. Ricevinte diplomojn de magistro pri artoj kaj doktoro pri filozofio de la universitato de Oksfordo, en Britio, li laboris, ekde 1994, en la “Malferma Universitato” (Anglio), la Universitato de Kimrio (Kardifo) kaj la Universitato Dalhousie (Halifakso, Nov-Skotio). Li membras en pluraj redakciaj estraroj, kiel ekzemple Millennium kaj Byzantinische Zeitschrift, kaj li ankaŭ servis kiel prezidanto kaj de la Brita kaj de la Kanada Esperanto-asocioj. 2018. (ed. with Sylvain Janniard) Le monde de Procope / The World of Procopius. Paris: Editions de Boccard. 2018. ‘The impact on Asia Minor of the Persian Invasion in the early seventh century’ in C. Şimşek and T. Kaçar, eds, Geç antik Cağda Lykos vadisi ve çevresi / The Lykos Valley and Neighbourhood in Late Antiquity. Istanbul: 13-26. 2015. ‘Government and Mechanisms of Control, East and West’ in M. Maas, ed., The Cambridge Companion to the Age of Attila. Cambridge: Cambridge University Press 26-43. 2015. ‘Les Jafnides et la défense de l’empire au VIe s.’ in D. Genequand and C. Robin, eds., Les Jafnides. Des rois arabes au service de Byzance (VIe s. de l’ère chrétienne). Paris: Editions de Boccard 121-54. 2015. (ed. with Hugh Elton) Shifting Genres in Late Antiquity, Farnham: Ashgate. 2011. The Chronicle of Pseudo-Zachariah Rhetor. Church and War in Late Antiquity (Translated Texts for Historians, 55), Liverpool: Liverpool University Press, (with Cornelia Horn and Rob Phenix).